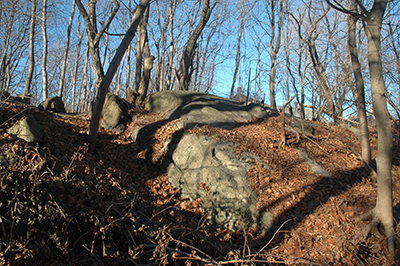 This page is an on-going effort to provide information to the many people who contact with with questions about the Salem witch trials (particularly the Gallows Hill Project, and efforts to properly maintain and care for Proctor's Ledge). Bewitchment in Salem: The Real Story. An hour long panel discussion, were Richard Trask, Marilynne Roach, Katherine Howe and Emerson Baker answer many of the key questions about the Salem witch trials (2014 video). "A Storm of Witchcraft: The Salem Trials and the American Experience," Emerson Baker's presentation to the Minnesota Historical Society, October 18, 2014, via Minnesota Public Radio. "Emerson Baker looks at Salem's past," on Nightside with Dan Rea, WBZ 1030 AM (Boston) A general discussion about the Salem witch trials, and links to today (aired on Dec. 14, 2014, 10:00PM). "Site of Salem Hangings during witchcraft hysteria confirmed," Pam Cross, WCVB-TV, Boston, January 13, 2016. This product of Professor Benjamin Ray and the Scholar's Lab at the Univerity of Virginia has transcripts an original images of the Salem witch trials records, other 17th century Essex County court records, contemporary and historical accounts of the trials and Salem, and a host of other materials. This is the single most important if you are researching the witch trials. This site, developed by Salem witch trials expert Margo Burns is exactly what the title suggests. It includes some original content, as well as links to many sites on the witch trials as well as other aspects of 17th century life. Notably, it includes a vaulable cross-reference to accessing the witch trial records from published and on-line sources. An excellent web site on a non-Salem case of Massachusetts witchcraft. This important and collection of European and American historical sources are available on-line digitally scanned and also transcribed. The site also includes some very good papers by students of Mary Beth Norton on the Salem witch trials. Salem Witch Trials: Examine the Evidence. An award-winning introuduction to the witch trials developed and featuring leading scholars, it shows regularly at NPS Headquarters, Liberty Street, Salem. Click here to view the trailer. Witch City. Told from the perspective of a returning native, this impressive documentary looks at the Salem's ongoing relationship to the witch trials, and the conflict between commemorating the events of 1692 and efforts to profit from this history. Click here to view the trailer. Three Sovereigns for Sarah. Produced for PBS's American Playhouse in 1985, this three hour drama tells the story of Sarah Cloyce and her two sisters, all tried for witchcraft in 1692. Leading scholars on the trials served as advisors, so this is a very authentic drama. Salem: Unmasking the Devil. This 2011 documentary was produced for the National Geographic Channel. It focuses on the first months of the witch trials, and in particular the very important role of Reverend Samuel Parris in the spread of the crisis. Witch Hunt. This 2004 documentary was produced by Lone Wolf Productions for the History Channel. It includes leading scholars of the witch trials. Days of Judgment is a documentary developed by the Peabody-Essex Museum for the Salem witch trials tercentenary in 1992.